is it just me, or do all bakers eat their food while they photograph it? izy? does this ever happen to you? it happens every. single. time. (see first .gif for reference). well i just created this whip-up-anytime recipe with some medjool dates i had bought from our family lunch date/shopping spree at eataly. medjools alone are soft and so incredibly sweet that you could enjoy them on their own, stuffed with almond butter, or even some homemade (1-hour ground in-frustration) hazelnut butter. just know that my food processor broke, and my last resort was a magic bullet. yes. it was an hour or so. but seriously, i've seen so many raw/non-raw bars using medjool dates, walnuts, cacao etc. so i knew i had to try to make something of my own. 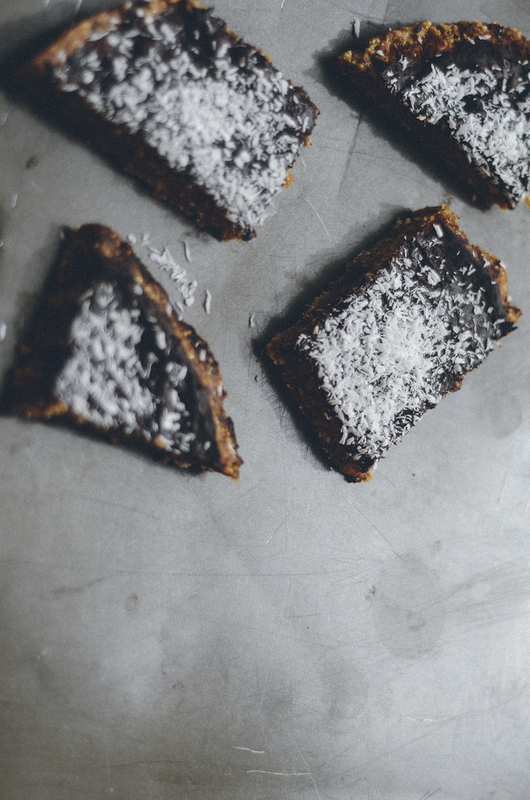 oat & nib "blondies" + chocolate "frosting"
07. sprinkle with coconut and enjoy! 08. i recommend refrigerating it for at least 3 hours before eating, but you can eat it right then and there if you'd like! have a fantastic and rain-free weekend everyone!